Stators are the stationary part of an Alternator, while the Flywheel is the moving part that helps generate a charge. Almost like what you would see on a bicycle tire, Stators have multiple “spokes” that extend from the center. These “spokes” are usually constructed out of a number of thin iron plates stacked on top of one another. At the end of these “spokes”, is a form of a magnet wire (usually copper). 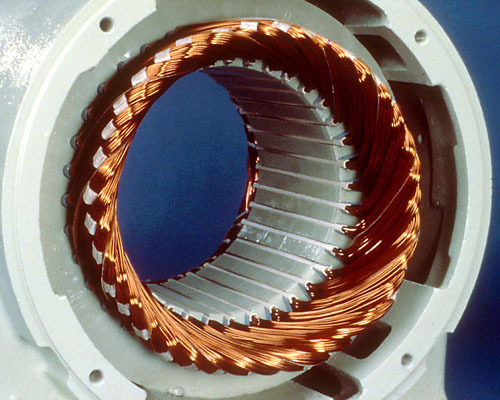 As the Flywheel (the non-stationary part of an Alternator) moves around the Stator, the permanent magnetics on the Flywheel generate AC power which is conducted through the copper wire on the Stator, and often times the AC power is sent to a Rectifier which will convert the Alternating Current (AC) to Direct Current (DC) to power electrical systems that require Direct Current.